Client: Signbox was commissioned to deliver a CAT A signage project by architect, Sheppard Robson, on behalf of contractor, Mace Group, for One Bartholomew, a 12-storey, 221,000 sq.ft office building owned by property investor, Helical plc. 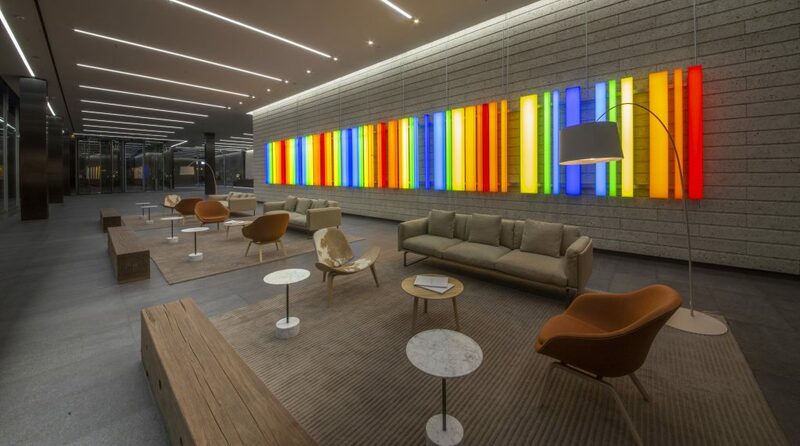 Role: Signbox devised a compelling solution for the architect’s ambitious scheme to create an exhilarating visual impact installation that spells out the building’s name in bar code (within the vast, double-height reception space of One Bartholomew). Challenges: This project proved demanding, as Greg Bailey, Senior Project Manager at Signbox, revealed. “Creating a solution that would articulate the architect’s vision was not without its difficulties,” he explained. “The complex cabling and environmental factors had initially seemed insurmountable but, after much collaboration and feasibility research, our team devised a solution that would enable us to interpret and execute the scheme to achieve the desired impact. Technical details: The installation is suspended in front of a mechanically fixed stone wall cladding system and recessed lighting troughs were required to render the intricate LED cabling invisible. The lighting raft was also a substantial size. It was manufactured in aluminium in five, three-metre sections so it could be transported to the new building ready for assembly on site. The face elements of the bar code were fabricated from a specialist Perspex that would optimise the installation’s colour performance and impede any potential LED hotspots, while 3M translucent vinyls ensured the precise colour gradients could be achieved and present this ingeniously branded signage exercise to best effect. Outcome: Such has been the impact of the installation on this City space, it has fast become a referenced landmark for visitors to One Bartholomew, and also to those in its immediate vicinity. The illuminated bar code is projected across the interior space of the building and out into the streets beyond. Case Study Submitted by Signbox, Mark Bartlett Managing Director (mark@signbox.co.uk).